Shopping for a 24" wide stackable laundry set? Thanks to Splendide Laundry Centers®, you no longer have to settle for sub-par construction, small load capacities or skimpy cycle options. Splendide’s new Ariston stackable collection gives RVers, boaters and apartment dwellers exactly what they've been looking for in a compact laundry pair. 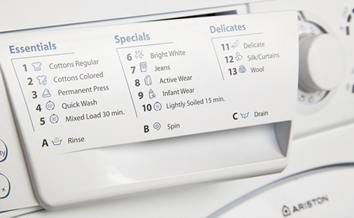 Like Splendide's all-in-one models, but designed for people who have a little more space and need to wash and dry bigger loads, the Ariston stackables are entirely new, yet offer the same high quality, superior resource savings and unmatched after-sales care that Splendide customers have enjoyed since 1984. Compare for yourself. 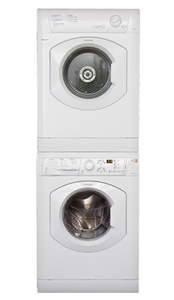 With a 4 cubic foot dryer drum, attractive Italian design, extra-large door openings, and handy features like "Auto Dry," it's easy to see why Splendide's Ariston Collection is the undeniable new class leader in the compact stackable laundry world. ** 240V set also available. Please contact Splendide for details. ***Optional SK02 RV/Marine stack kit sold separately.